IBBSS is a product designed especially for Backlog conversion projects. The first version of IBBSS developed in 2007. IBBSS has been used ever since 2007 in several backlog projects by IT-Blocks at various customers with different needs. More releases of IBBSS have been developed before the latest version that is used by SBM at the Saudi Ministry of Water and Electricity. Other releases have been used in Commercial International Bank of Egypt and Saudi Real Estate Development Fund. The system setup module is where all system parameters are configured. Different workflow parameters and data entry parameters are all configured using System Setup module. Standard parameters such as database schema, the path for destination ECM that will be used for uploading the files in the Upload module and others are also configured in System Setup module. The Documents Setup module is where document types are registered in the system and the standard structure of each document type. This module is responsible for creating the folder structure where images reside after being scanned. Besides, using Documents Setup module, users define the required indices of each document type that are used for creating the database that will be filled during indexing stage. Documents Setup is also the main input for the Indexing module to apply needed validations in the indexing field. When any other user logs into the system he views similar interface but just containing the documents that he is assigned to work on at the time. When he finishes working on a document, he just routes it back with a newly finished status. 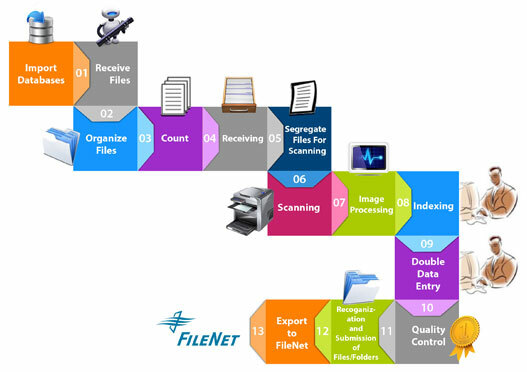 Since this module is used mainly for file tracking through the project, the module has an option to have a special field for Files locations and thus physical tracking. otherwise files locations are defined as with the user who is assigned to work on them. This module is also used by the customer for QC and follow up reasons. They are shown the same comprehensive interface, yet with their corresponding functionality. The Uploading module is an integration module where IBBSS has an especial version for the destination ECM. For now, IBBSS only supports FileNet P8, DB2 CM and MS- SharePoint repositories. The uploading module maps the documents indices to their corresponding document classes in the ECM, checks compatibility and then migrates data and images from IBBSS to the ECM. The Uploading module has some parameters for how to deal with existing files in the repository such overriding, rejection and prompting.